Are Carpet Stains On Your Holiday Guest List? | Natural Carpet Cleaning & More! There are a million things to do when preparing the house for Thanksgiving dinner and the holiday season. We focus so much on what is at eye-level that sometimes we forget to look down at our feet until our house is full of our closest friends and then we see… Oh My, what is that? A cranberry juice stain that never came out? This is no time to forget about cleaning the carpets. You’ll be busy getting ready for guests soon, so *do* look down to check for dingy-looking color and stains. Do you need to call a Philadelphia carpet cleaning pro? Don’t wait until the last minute to make sure your house is ready for entertaining holiday guests! Carpets are notorious for hanging onto stains that reemerge with added foot traffic. No matter how many times you vacuum or scrub, they always seem to come back! That’s because most household cleaners can’t get deep down to the root of the stain – they can only get what shows on the surface. The dirt and soot left deep in the fibers at the base of the carpet rise back to the top as people walk around. This is why the carpets look dirty again after you clean them yourself. With the help of a Philadelphia carpet cleaning professional, your carpets will be deep cleaned as all the deep-down grime is lifted and removed from the fibers. Not all carpet cleaning companies in the Philadelphia suburbs are the same, so be sure to ask questions before you choose one. You need to be sure that they guarantee their work and that they don’t use cleansers that leave a chemical residue. You also want to be satisfied with the results for a long time. A1 Sparkles uses state-of-the-art equipment to penetrate the deepest stains when we clean your carpets and area rugs. Carpets do have a lifetime of use, so if we can’t get the grime and stains out then it’s not coming out! Our goal is to make sure you are 100% satisfied with our service. As a local family-owned business, we know how important it is to receive reliable service. The best part of our cleaning process is that it’s 100% natural. We use a Green Seal Certified pre-treatment and an eco-friendly carpet cleaning technique that uses no soaps or detergents and leaves no chemical residue or allergens. Once your carpets are sparkling clean, they will dry fast so you can get back to walking on them. If you don’t want to live with cranberry stains or wine stains over the next year, ask us about our Scotchgard Carpet Protector. With this protection, your carpets, upholstery, fabrics, and furniture can be protected from stains. The Scotchgard treatment repels water so liquid can’t penetrate the fabric. This is going to be important for your house during Thanksgiving dinner! 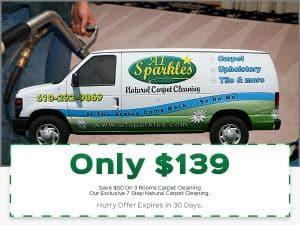 Whether you want a one-time carpet cleaning service or more regular cleaning for your Philadelphia home, A1 Sparkles offers several different carpet cleaning packages to fit your needs. We also offer discounts and a competitive price match guarantee. Just give us a call and we’ll be glad to walk you through each option. Contact us online or call us at (610) 292-9069.